A woman enters a casino, sits down at a high-stakes poker table, and draws a royal flush. She cashes in her winnings, walks to the casino next door, and does the same thing. Then she goes to a third casino and draws a third royal flush. What is a dispassionate observer to make of this scenario? Is it merely a highly improbable occurrence (although no more improbable — just more lucrative — than drawing the same losing hand three times over)? 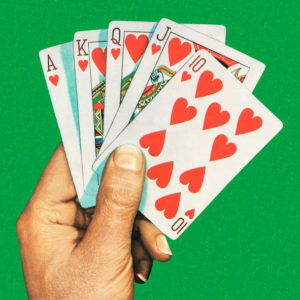 Casinos may believe that in general one person in a thousand is a cheater while the rest play with random hands. But the fact of our player’s lucky streak should significantly shift the likelihood that the alternative ‘cheater’ hypothesis is correct. John Hawthorne is a philosopher at USC who studies the intricacies of epistemology — the field that examines how we come to our beliefs, and when those beliefs are justified. In recent years, he’s been thinking about what a careful epistemologist might have to say about certain coincidences — some of which seem far more unlikely than a triple-royal-flush — that have recently been observed in particle physics and related fields. Most of these coincidences have to do with the very specific values of universal constants — the masses of subatomic particles, the strengths of atomic forces, or the value of a physical parameter known as the cosmological constant — which seem to be highly improbable from the perspective of physics, but upon whose precise values the entire possibility of a galaxy-filled, life-sustaining universe seems to hang. A system with those types of constraints is said to be finely tuned, and the concept of fine-tuning on the cosmic scale has caused excitement and consternation in and beyond beyond the worlds of philosophy and physics. Is this fine-tuning an extraordinary coincidence, is it a proof that we live in a divinely created universe, or is it rather a sign that our improbable universe is part of a far larger multiverse containing a multitude of other universes ? Because it gets at these sorts of high-stakes questions, fine-tuning theory has spurred numerous philosophical responses. Unfortunately, Hawthorne says, much of what has been produced is either empirically or philosophically uninformed. “There is a lot of writing that uses the unhelpful notion of ‘crying out for explanation,’” he says. A more careful epistemological response looks at these coincidences less as demanding explanation than as offering potentially useful information for rebalancing the odds of various competing hypotheses. To correct those notions, philosophers need a better grasp of physics and physicists need a better understanding of which elements of fine-tuning are the most intriguing. For Hawthorne’s part, that means a three-way collaboration with philosophically-minded particle physicist Aron Wall (currently at Stanford but soon to take a permanent position at Cambridge University), and with another rising epistemologist, Yoaav Isaacs, who is currently Hawthorne’s postdoctoral fellow at USC. Hawthorne is hopeful that the work will make for both better philosophers and better physicists, yielding approaches and conclusions that are more nuanced, even if at the expense of some of fine-tuning theory’s initial buzz. Learn more about team members John Hawthorne, Yoaav Isaacs, and Aron Wall.